As part of Selling Your Screenplay’s suite of professional screenwriting tools we’ve created a members only screenwriting forum. Inside the forum produced screenwriter Ashley Scott Meyers will be answering questions, giving career advice, and critiquing log lines, query letters, and synopses. The goal is to build a community of serious screenwriters so they can share information, help each other out, and grow their careers together. 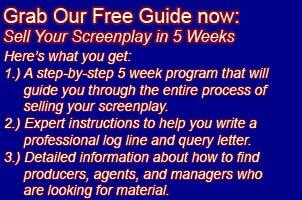 The forum will act as a workshop for writers to get their query letters in shape so they can use Selling Your Screenplay’s email and fax query letter submission service. Ashley Scott Meyers will help writers get their query letter up to professional standards, and once it’s approved, writers will have access to our email and fax query letter submission service which has more than 500 email addresses and/or fax numbers of agents and managers and more than 1000 email addresses and/or fax numbers of producers and production companies in it. Our query letter submission service is only available to members of the forum. Inside the forum we will be creating writer’s groups where you can share your work and critique other people’s work within a small group of other writers. Reading other writer’s material and getting feedback on your own is a key ingredient to growing and improving as a writer.